The second part of dementedchris’ food adventures in Beijing. Crazy eats! Reward her for finishing everything. Support her story, A Kind of Flotsam, by casting your vote for it in the Philippine Graphic Fiction People’s Choice Awards. Who knows, we might be able to persuade her to eat crazier things if she wins! “You have to try some silkworms,” my friend John Rae urged, as we made our way back from the Great Wall. Not that I really needed much urging at that point; I was determined to try something out of the ordinary. And Donghuamen Night Market’s Snack Street, a colorful row of food stalls to the left of Wangfujing, is anything but ordinary. Here, the everyday meets the exotic. 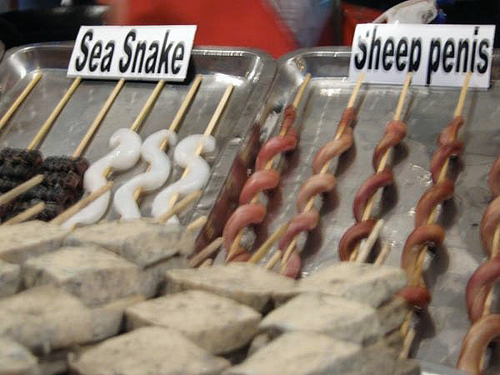 Bowls of steaming noodles sits beside stalls selling sea snakes and sheep penises. When my friends and I were there last summer, it was early evening, and the string of stalls was slowly filling up with people — local teenagers pulling each other in search of a snack, foreigners eager for a taste of adventure. I noticed that a good number carefully watched what everyone else was trying first, in what I would suppose passed for calculated deliberation (or another version of eeny-meeny-miny-moe) in a circumstance like this. Snack Street has plenty for everyone, something you’ll discover as you stroll down the brightly-lit stalls and catch bits of the vendors’ enthusiastic sales talk. Most of the vendors can speak a little English, but the prices are printed on huge boards atop the stalls if you’re not in the mood to negotiate. Even if you end up not trying anything, the experience is an interesting way of spending an evening in Beijing. We headed for the starfish first. I thought it was a safe start, because they looked harmless–and pretty. Pretty always works. 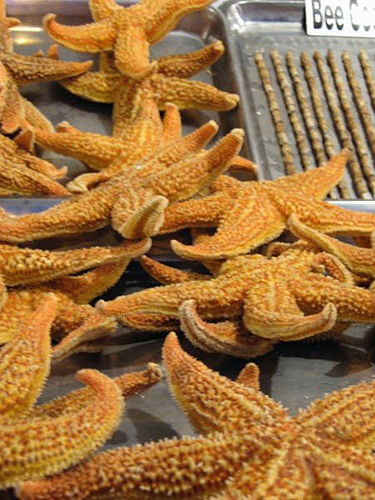 The starfish were deep-fried so that the exterior hardened into a crunchy shell. I opened mine and ate what was inside, which reminded me a little of crab fat. My friend Oz bit into everything, shell included. Until now, we still don’t know which was the proper way of a starfish, but if it helps, both of us are still standing. Not bad for our first exotic snack in Beijing. One of my friends suggested that we alternate between the weird and the normal, an idea which I agreed with hastily. As attracted as I was to the strange new tastes, I knew my normally-queasy stomach would want something to anchor it as the evening went on. So we tried some cream balls, fried little balls of flour sprinkled with sugar(if they had cream inside, it must not have noticed), which to me tasted like banana fritters. 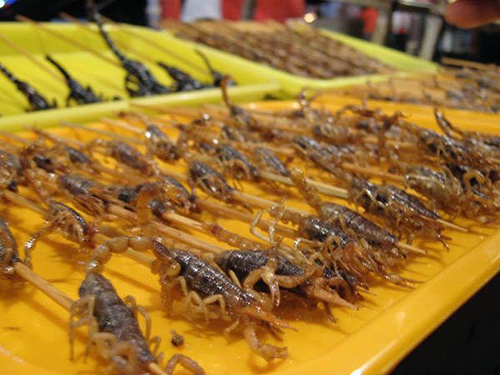 I wasn’t prepared at how much I liked our next exotic meal: scorpions! Three small ones on a stick cost about 15 RMB. They were deep-fried and had a crunchy, salty taste. We each bought a stick to start with but Oz and I liked it so much that we bought a second one to split. 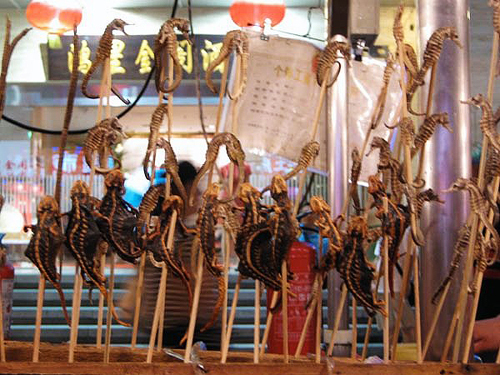 The stall also sold larger scorpions, but it was a bit more expensive so we were happy with our small ones. Now we were getting a bit thirsty. 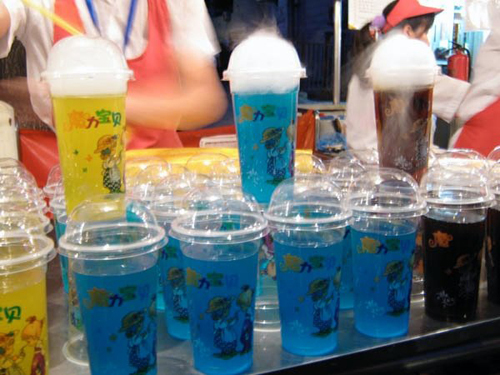 Oz went for some bubble tea, which I wouldn’t even recommend if it didn’t have that bubbling, smoking thing going on. It was like soda diluted with lots of water. But I think bubbling anything makes for pretty interesting dining experiences so it wasn’t such a waste in the end. Back to the exotic. Because John Rae had mentioned it even before we stepped onto Snack Steet, the silkworm larva was next on our list. He said it was crunchy, and with the small, compact shape, I was already imagining that it would taste something like chicharong bituka. Unfortunately, I was in for a surprise. Either the silkworms that we had were undercooked or the ones that John Rae had tried the night before were the fluke, because the silkworms were chewy, not crunchy. Really, really, really hard to keep down. Mine burst when I bit in, with all the insides filling my mouth. My mouth’s inner walls were starting to itch. I didn’t know what to do with the rest of the chewy shell, as I tried to cut it into more manageable pieces. In the end, I dropped the rest of it into a waiting trash can, my only tragic failure of the evening. I tried, believe me. I ended up with one horrible allergy, but I tried. That bubble tea was suddenly looking better and better. To appease my shocked taste buds, I headed for the nearest comfort food I could find. 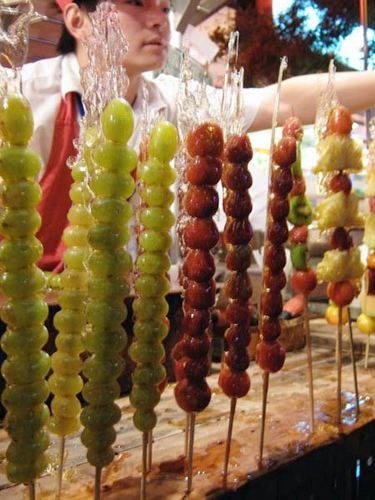 Both Donghuamen and Wangfujing are filled with sticks of candied fruits, a delightful mix of strawberries and kiwis and other delicious-looking treats. The three of us shared one stick — it was too sweet a delight to finish alone. With my allergy rapidly making one side of my mouth swell (the side where I had kept chewing at the silkworm shell), we knew that the evening was about to come to a close. Our last bite were some sea horses. They weren’t as good as the scorpions, but I don’t know if that was because mine was dipped in vinegar and some spicy sauce. I’m not a big fan of either. 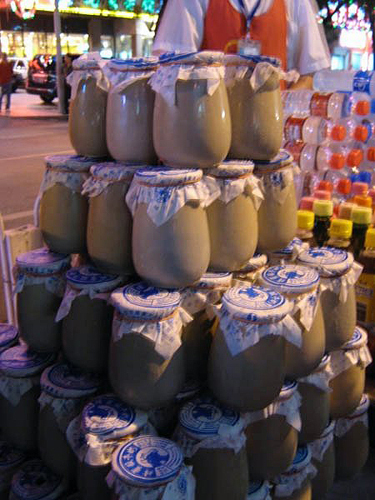 To wash it all down, we bought some yogurt milk in glass bottles, which was about 10 RMB. We sipped it through little straws, amused and satisfied with our evening. 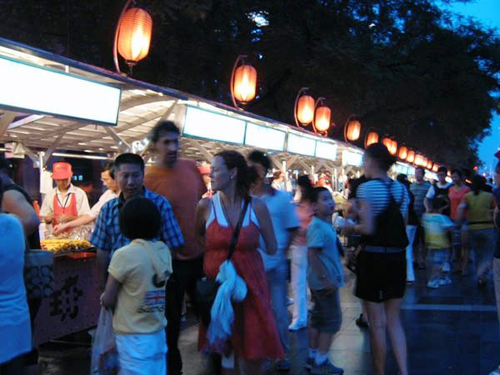 Maybe locals frown at this place as a huge tourist trap, but if you’re looking for an adventurous night around Beijing, Donghuamen Night Market is the place to go. My friends and I were misled by the thought of a ‘snack street’; by the end of the evening, we were all pretty full. Lots of unexpected treats in one unexpected city. Just don’t forget the antihistamine. Missed out on part 1? Catch up here! This entry was posted in food trips, guest blogs and tagged beijing, candied fruit, china, dementedchris, scorpion, seahorse, silkworm, streetfood. Bookmark the permalink. 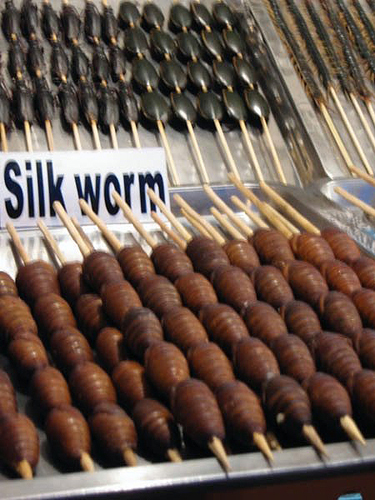 i tried the silkworms, and didn’t like it … taste like ipis (or what i imagine ipis tastes like), eww. Thanks for letting me share my gory story! Aha! That means the fluke was the one my friend tasted. He claimed it was crunchy! I had the chewy bit, too… para ngang ipis. Thanks! I really try to be adventurous when I’m in a new place. I learned a valuable lesson too! All I saw were herbal drugstores; I didn’t know where to find antihistamine. ^^; Buti buhay pa! But then, a surprising number of cultures eat animals’ reproductive organs as aphrodisiacs so I guess that’s what led to this. Would you dare? I’m not sure if I’ll have the guts.